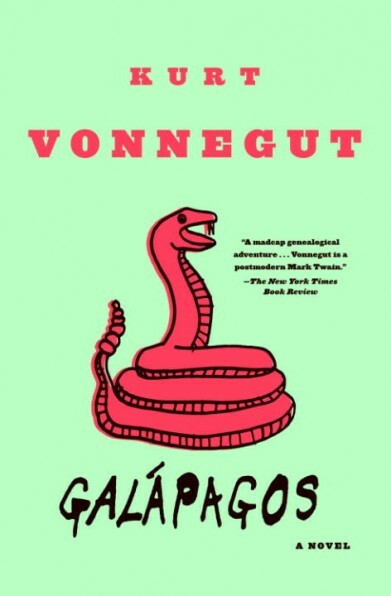 Galápagos is a sort of dystopian-science-fiction treatise on evolution. The world has sunk into depression, unknown bacteria are making women infertile, and WWIII is about to break out. Ten people – one male and nine females – end up on a cruise ship and are stranded on the Galápagos island of Santa Rosalia. Their offspring eventually become the only people left on earth, and evolve over the next 1 million years until they are far more animal-like than human. The story is told in little chunks zigzagging through time by a narrator whose story is not known until near the end. The first book I read by Vonnegut was Slaughterhouse 5, sometime back in high school. I was too young at that point, it think, and I just didn’t get it. I mean, I understood the plot, but the meaning went way over my head. I decided it was time to give Vonnegut another try and I’m glad I did. I really enjoyed Galápagos. I loved the way the story was woven together in little chunks. While I didn’t enjoy the frame story (narrator’s story) as much, I appreciate why it’s there and how that allows us to see the evolution of humans over a million years. The book felt like an appropriate tribute to Darwin, and ironically I think I learned more about the theory of evolution from this book than I ever learned from school. One thing I hadn’t expected when I started reading Galápagos was a side-theme of intimacy between two women. Two of the passengers on the ill-fated cruise, a pregnant Japanese woman and a blind woman, pair off once they arrive on the island to raise the Japanese woman’s baby together. After their daughter grows up and leaves to live in her own place, the two women – who have never been separated in more than 20 years – commit suicide together by drowning. They hold hands and walk into the water together. While there is no implication of a sexual relationship between the two, there is this wonderful portrayal of love between them. It was so unexpected and yet beautiful. This entry was posted in 2010, Adult, Prose and tagged cruise, speculative. Bookmark the permalink.